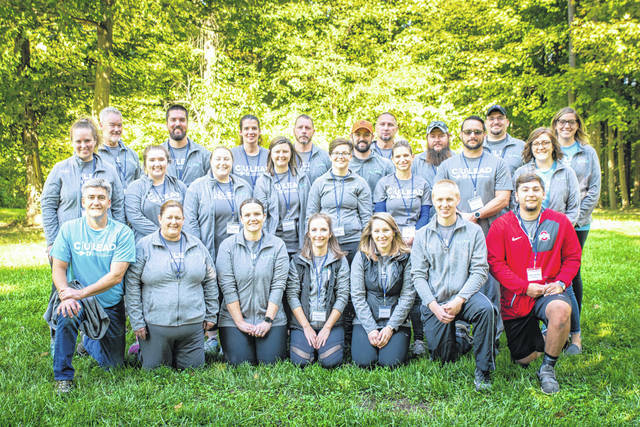 Photo courtesy Adam Knapp/Arkphotodesign The Crawford Unlimited Lead 2018-2019 cohort poses for a group photo during the kick-off retreat in September. CU Lead is a nine-month experiential program designed for leaders of all levels. In its eighth year, more than 120 local leaders have graduated from the program. To enhance the quality of life in Crawford County by creating a network of passionate leaders. CU Lead is sponsored by Ohio Mutual Insurance Group. Tuition includes activity fees, course materials, meals, journals, and class shirts. Scholarships are available on a case-by0case basis. The CU Lead application is available online on the Crawford Partnership website. The deadline to apply for the 2019-20 20 CU Lead cohort is Friday, April 12. Applicants are asked to submit their résumé and one professional letter of recommendation for consideration to be nominated for selection. For more information, call the Crawford Partnership at 419-563-1809.
https://www.galioninquirer.com/wp-content/uploads/sites/38/2019/03/web1_CrawfordUnlimitedLeadership.jpgPhoto courtesy Adam Knapp/Arkphotodesign The Crawford Unlimited Lead 2018-2019 cohort poses for a group photo during the kick-off retreat in September.